This is what happens when a conditioned soul meddles in the perfect transcendental writings of a nitya-siddha pure devotee of Lord Shri Krishna! Above Srila Prabhupada himself clearly says three times that his 1972 Macmillan published book is the manuscript. A previous draft is just that, a draft. To revert an author’s work posthumously without his blessings is simply a big gamble and definitely unauthorized! Srila Prabhupada clearly says that it is the “complete edition” in this above quoted paragraph. Also in the very front of the book (next to the publishers page) under the title of the book, in all caps and boldface letters it is stated “COMPLETE EDITION“. Thus absolutely establishing this point and making it clear that the book is finished/complete! To change the book now would imply that it is actually not complete and that the person changing it must feel themselves to know better than the author. Unfortunately the staff at the BBTI have completely removed the words “COMPLETE EDITION” and replaced it with “REVISED AND ENLARGED”. Calling the draft a manuscript is simply word jugglery and disobeying and contradicting Srila Prabhupada’s words printed directly in the book itself. This is a very sly move that directly opens the door for unlimited changing of the text of Srila Prabhupada’s perfect transcendental books! It creates a mentality that Prabhupada’s books are imperfect and thus not transcendental. Naturally the effect of this is that it creates the impression that if the books are not complete and perfect (they need a conditioned soul to constantly edit them to keep them relevant and/or remove all the “mistakes”) then they are also not to be followed with one’s life and soul. It also takes the validity away from Srila Prabhupada’s finalized and approved books thus further directly paving the way for more unlimited changes by the imperfect minds and senses of conditioned souls now and in the future. Over just the last 20 or so years there has been over 5000 changes to Prabhupada’s Gita. Just imagine in the future maybe 30 or 100 years from now, at the rate we are going, our children or our grandchildren may pick up a book with Srila Prabhupada’s name on it and it will be a whole different book. A book full of words and changes from the mental speculations of a conditioned, imperfect soul full of anarthas. So naturally when one opens their heart and soul to those words, changes, mental speculations and anarthas that are now present within the pages of Srila Prabhupada’s once holy and pure transcendental book, what benefit will there be? It seems simple to me. Jayadvaita Swami was not there when Hayagriva and Srila Prabhupada were creating his Bhagavad-Gita. Why would I want to read the version of a conditioned soul who wasn’t even there when Prabhupada was manifesting his book through the literary gifts of Hayagriva? Hayagriva was the conditioned soul that Prabhupada specifically chose, empowered and gave specific instructions to for that seva. These instructions may have never been recorded anywhere – if one wants to benefit from them one must simply read Prabhupada’s original books. So why second guess Srila Prabhupada, step over his head and read some other conditioned soul’s unauthorized, revised editions? It just makes no sense to me. Srila Prabhupada never designated Jayadvaita Swami to revise the Gita after Srila Prabhupada’s departure, and Jayadvaita Swami admits it. So it seems to come down to this: who do you want to trust? The person Srila Prabhupada chose, designated and empowered to finish and complete the book, or someone else that unauthorizedly changes that finished complete edition, without his approval and after his departure? The 1972 Macmillan edition was good enough for Srila Prabhupada, so it’s good enough for me. Just because Srila Prabhupada at one point said someone was a good man, does that mean that they are one now? Srila Prabhupada liked many devotees at one point and at that point put them in positions of power and authority and praised them, but later on down the road he changed his opinion about them and/or they went astray or deviated to one degree or another. So although at one point Prabhupada approved of someone and complimented them, that does not mean that from that point on they are bona-fide no matter what they do. Here are a few examples to further examine this point. One Prabhupada disciple did HUGE service for Prabhupada, pushing on the book distribution mission (probably) more than any other Prabhupada disciple in ISKCON’s history, and was pretty much running ISKCON at one point. But later he changed the basic rules of the four regulative principles to three. Does that mean because he had so many thousands of disciples, and at one point was so dear to Srila Prabhupada that Prabhupada even commented on how he was so intelligent and empowered, that now we should all only have three regulative principles instead of four and continue to follow this devotee? Srila Prabhupada established the GBC as the ultimate managing authority for all ISKCON. But at one point Srila Prabhupada totally disbanded the whole of the GBC within ISKCON due to their deviations! So simply because at one point in time Srila Prabhupada appointed them to power and trusted them, does that give them permanent power? No! At any time anyone can lose their position and power and deviate or go astray and at that point one is no longer authorized and empowered. Unfortunately there are so many examples I could mention, but in order to not depress/and embarrass all of us unnecessarily in this article I will stop here. I guess it just takes a bit of intelligence to figure all this out. But for those that look at the world through extremes and feel that a rubber-stamp carries more weight than common sense does, what can be said to persons like that? Even great sages have fallen from their exalted positions. Even after getting blessings to be in positions. It’s nothing new, it’s in the Srimad-Bhagavatam many times. This is why we conditioned souls have to be really careful in messing with Srila Prabhupada’s perfect transcendental books. On that same note, we should be even more careful of those devotees that feel they can mess with them. Yes, I wholly agree with this position of not altering the words or the stated intenitons of Srila Prabhupada in any way. This strict adherence seems the very least we can do, and the very best we can actually do for ourselves in this regard. intentions, not intenitons… see how fallible we conditioned souls and personalities are! LOL at myself here. It’s so beautiful the way this is all unfolding. We, like Krishna counseled Arjuna, must not be conditioned so as not to speak out or to be too timid about engaging in fair fighting with our brothers for what is right in maintaining the proper lineal descent of Direct Knowledge of Sri Krishna, His Associates, Lilas, Paraphenalia, Work and Play upon, after all, His Stage with we his marginal potency spirit-souls. Amen. 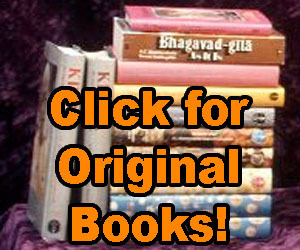 for FIGHTING to save Srila Prabhupadas Legacy HIS ORIGINAL- Pure Unchanged BOOKS ! The power and Potency of the words of Srila Prabhupada will be lost if this is allowed to continue. Thank you so much and I pray that others will please try to stop this great insult to The great acharya Srila Prabhupada. who are we to change a single word , less we change the inference . and likewise with all instructions , less the purity be lost .